For other uses, see Germania (disambiguation). 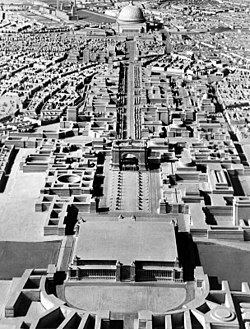 A model of Adolf Hitler's plan for Berlin formulated under the direction of Albert Speer, looking north toward the Volkshalle at the top of the frame. Just as the Bavarians and the Prussians had to be impressed by Bismarck of the German idea, so too must the Germanic peoples of Continental Europe be programmatically steered towards the Germanic concept. He [Hitler] even considers it good that by renaming the Reich capital Berlin into 'Germania', we'll have given considerable driving force to this task. The name Germania for the Reich capital would be very appropriate, for in spite of how far removed those belonging to the Germanic racial core will be, this capital will instill a sense of unity. As world capital Berlin will only be comparable with Ancient Egypt, Babylon, and Rome! What is London, what is Paris compared to that! The official plan for rebuilding Berlin, which Albert Speer was put in charge of, was called the "Comprehensive Construction Plan for the Reich Capital" (German: Gesamtbauplan für die Reichshauptstadt). The Schwerbelastungskörper was built in order to determine whether the unconsolidated Berlin ground could support the weight of the planned triumphal arch. Doubts persisted at the time as to whether the marshy Berlin ground could have taken the load of the proposed projects, leading to the construction of an exploration building (Schwerbelastungskörper, literal translation: heavy load-bearing body), which still exists near the site where the Arch of Triumph would have been built. It is basically an extremely heavy block of concrete used by the architects to test how much weight the ground was able to carry. Instruments monitored how far the block sank into the ground. The Schwerbelastungskörper sank 18 cm (7 1⁄8 in) in the three years it was to be used for testing, compared to a maximum allowable settlement of 6 cm (2 3⁄8 in). Using the evidence gathered by these gargantuan devices, it is unlikely the soil could have supported such structures without further preparation. The plan was to cover the Schwerbelastungskörper by building a bridge over it. The arc would have been near by, but problems with the Axis running through infrastructure would have made it difficult to establish any convenient location. The razing of old buildings to make way for the reconstruction of Berlin began in 1938 in various places around the city, including the Alsen district, where the Great Hall would stand, and the Tiergarten district, where Speer planned to build the House for German Foreign Transport, and where the Kaiser-Wilhem-Strasse would intersect with the great East-West Axis which was to be built. The East-West Axis was completed in time for Hitler's 50th birthday celebration a year later, in 1939, when Speer ceremoniously presented it to the Hitler with the words "My Führer. I should like to report the completion of the east-west axis. May the work speak for itself." Speer designed a new Chancellery, which included a vast hall designed to be twice as long as the Hall of Mirrors in the Palace of Versailles. Hitler wanted him to build a third, even larger Chancellery, although it was never begun. The second Chancellery was destroyed by the Soviet army in 1945. Swedish Bohus granite was imported to be used as building material in Germania. However, after serious setbacks in the German invasion of the Soviet Union, which Hitler had initially seen as another blitzkrieg ("lightning war"), construction on "Germania" was halted for good in March 1943. Almost none of the other buildings planned for Berlin were ever built. Berlin was to be reorganised along a central 5-kilometre-long (3 mi) boulevard known as the Prachtallee ("Avenue/Boulevard of Splendour(s)"). This would run south from a crossroads with the East-West Axis close to the Brandenburg Gate, following the course of the old Siegesallee through the Tiergarten before continuing down to an area just west of Tempelhof Airport. This new North-South Axis would have served as a parade ground, and have been closed off to traffic. Vehicles would have instead been diverted into an underground highway running directly underneath the parade route; sections of this highway's tunnel structure were built, and still exist today. No work was ever begun above ground although Speer did relocate the Siegesallee to another part of the Tiergarten in 1938 in preparation for the avenue's construction. The plan also called for the building of two new large railway stations as the planned North-South Axis would have severed the tracks leading to the old Anhalter and Potsdamer stations, forcing their closure. These new stations would be built on the city's main Hundekopf (dog's head) geography S-Bahn ring with the Nordbahnhof in Wedding and the larger Südbahnhof in Tempelhof-Schöneberg at the southern end of the avenue. The Anhalter Bahnhof, no longer used as a railway station, would have been turned into a swimming pool – in post-World War II Moscow, this actually happened in 1958, at the building site of Joseph Stalin's never-completed Palace of the Soviets. At the northern end of the avenue on the site of the Königsplatz (now the Platz der Republik) there was to be a large open forum known as Großer Platz with an area of around 350,000 square metres (3,800,000 sq ft). This square was to be surrounded by the grandest buildings of all, with the Führer's palace on the west side on the site of the former Kroll Opera House, the 1894 Reichstag Building on the east side and the third Reich Chancellery and high command of the German Army on the south side (on either side of the square's entrance from the Avenue of Splendours). On the north side of the plaza, straddling the River Spree, Speer planned to build the centrepiece of the new Berlin, an enormous domed building, the Volkshalle (people's hall), designed by Hitler himself. It would still remain the largest enclosed space in the world had it been built. Although war came before work could begin, all the necessary land was acquired, and the engineering plans were worked out. The building would have been over 200 metres (660 ft) high and 250 metres (820 ft) in diameter, sixteen times larger than the dome of St. Peter's Basilica. Towards the southern end of the avenue would be a triumphal arch based on the Arc de Triomphe in Paris, but again, much larger; it would be almost one hundred metres (330 ft) high, and the Arc de Triomphe (at the time the largest triumphal arch in existence) would have been able to fit inside its opening, evidently with the intention of replacing the rather long history associated with this Arch and in particular the unique ceremonies, with reference to the history of France, connected with it. As a result of the occupation of Berlin by Soviet troops in 1945, a memorial was constructed with two thousand of the Soviet dead buried there in line with this proposed 'Triumphal Arch'. It had been intended that inside this generously proportioned structure the names of the 1,800,000 German dead of the First World War should be carved, that which presumably was known to amongst others the Soviet leaders. ^ a b "Information place heavy load-bearing body". Informationsort Schwerbelastungkörper. Retrieved 13 January 2019. ^ "Hitler's Underground Lair". Cities Of The Underworld. Season 1. Episode 103. May 5, 2007. History Channel. Retrieved January 13, 2019. ^ Schouenborg, Björn; Eliasson, Thomas (2015). The Swedish Bohus granite - a stone with a fascinating history. EGU General Assembly. Vienna, Austria. Bibcode:2015EGUGA..1714883S. ^ "Défilé du 14 juillet, des origines à nos jours" [The July 14th Parade, from its origins to nowadays] (in French). Archived from the original on June 23, 2016. ^ Housden, Martyn (2000). Hitler: study of a revolutionary?. Taylor & Francis. p. 151. ISBN 978-0-415-16359-0. Speer, Albert (1970). Inside the Third Reich. Translated by Richard Winston; Clara Winston. New York: The Macmillan Company. Moorhouse, Roger (2010). Berlin at War: Life and Death in Hitler's Capital, 1939-1945. Bodley Head. ISBN 9780224080712. Wikimedia Commons has media related to Welthauptstadt Germania. Visions of Alt-Berlin in "Man in the High Castle", Ezra Haber-Glenn, MIT Department of Urban Studies and Planning. About the recreation of an alternate Berlin in The Man in the High Castle TV series. How The Man in the High Castle Brought Hitler's Future Germany to Life, Katharine Trendacosta, Gizmodo.